The White House Office of Management and Budget (OMB) has invited public comments on potential revisions to its 1997 standards. Currently, federal agencies are not required to count detailed data for Asian, Native Hawaiian and Pacific Islander Americans. In many cases, reporting by racial group can mask important differences among Asian and NHPI sub-groups. Thus, AAPI communities often remain misrepresented, under-funded, and left out of policy and program decisionmaking. In order to address this problem, it is vital to address not only the consistent collection of disaggregated data, but also its reporting and accessibility. Please consider joining the #CountMeIn campaign organized by a coalition of national AAPI organizations. At AAPI Data, we seek to contribute to this conversation on federal data standards by illustrating the importance of AAPI data disaggregation. We do so in a series of blog posts this week focusing on particular outcomes, finishing with health. 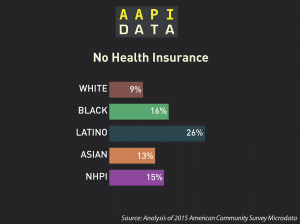 Compared to Whites, a larger proportion of AAPIs lack health insurance coverage, with 13% of Asians and 15% of NHPIs. Desegregating AAPIs we can see that there are several groups whose rates of uninsured are second only to Latinos. Nepalese, Korean, Pakistani, Burmese, Thai, Malaysian, Bangladeshi, Indonesian, and Bhutanese Americans have higher proportions of uninsured than African Americans, reaching as high as 22% for Nepalese Americans. 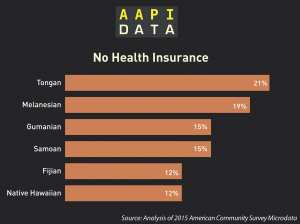 Similarly, 21% of Tongan and 19% of Melanesian Americans report no health insurance coverage. 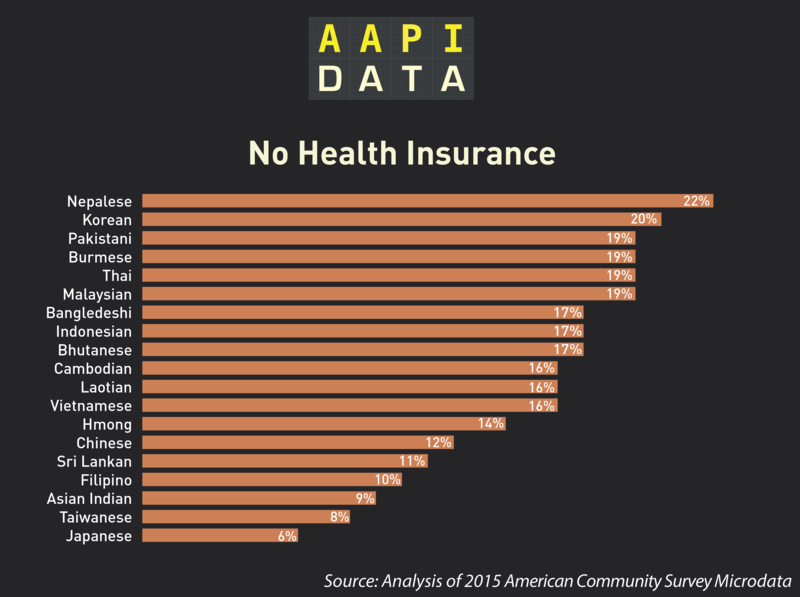 Asian Americans signed up for the ACA in very large numbers. By the end of the first open enrollment period, from October 2013 to April 2014,6 about 299,000 Asian Americans had signed up for insurance through the federally facilitated marketplace, or FFM.7 This accounted for 5.5 percent of all enrollees in the FFM and 7.9 percent of those who provided information on their race and ethnicity. By comparison, 5.1 percent of the uninsured population in 2012 was Asian American. For a closer look at the Disparities within the AAPI community we can look at data from the NHIS. Unfortunately the NHIS only collects data for the six largest Asian subgroups, aggregating the rest into “Other Asian.” Similarly, NHIS does collect subgroup data on the NHPI community and have even fielded the 2014 NHPI NHIS survey, confidentiality and privacy concerns prevent this data from being included in the public use file, though it is available in the restricted files. Despite these limitations, we can still see significant disparities among AAPIs. Click here to view the latest NHIS data brief for Asians and NHPIs. One final note: the analyses above rely on microdata from the American Community which is administered by the U.S. Census Bureau. We believe it is critical for the Census to continue collecting this data, expanding the number of detailed categories, and making the collection of detailed categories standard across federal datasets. Finally, and perhaps most importantly, this data needs to be more user-friendly and publicly accessible, rather than being hidden under a maze of FactFinder tables or requiring statistical software and knowledge to work with individual-level microsample data. For those interested in more detail about the differences in AAPI Income, please see our report with Center for American Progress or the latest reports from NHIS for Asians and NHPIs. To learn about how changes to the ACA could influence AAPIs please look at this infographic from the APIAHF. For more research and data on this topic, please visit our Health Care and Health Outcome pages at AAPI Data. Please consider joining the AAPI #CountMeIn commenting campaign.